Blood is Blood, But What About Photosynthate? Is it really so odd to consider kin recognition in plants? Plant roots grow more in proximity to genetically related plants (Bhatt) and the recognition of kin is based on chemicals secreted by the roots (Biedrzycki). 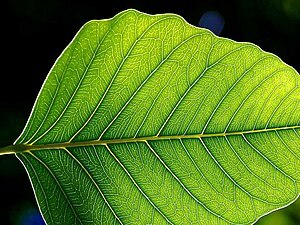 In a recent paper in New Phytologist, Crepy and Casal noted that plants also react to kin in the aerial portions; first by reorienting leaf growth when growing near kin, but not near unrelated plants of the same species; and secondly, by producing more seeds when interacting with kin vs. nonkin. Can we then consider plants connected via mycorrhizal associations step families? Bhatt, MV, Khandelwal, A, Dudley, DA. (2011) Kin recognition, not competitive interactions, predicts root allocation in young Cakile edentula seedling pairs. New Phytologist. 189: 1135-=1142. Biedrzycki, ML, Jalany, TA, Dudley, SA, Bais, HP. (2010) Root exudates mediate kin recognition in plants. Communicative and Integrative Biology. 3. 28-35. Crepy, MA and Casal, JJ. (2014) Photreceptor-mediated kin recongition in plants. New Phytologist. 205: 329-338.